Happy Wednesday, mid weekers! Yes, its hump day, which, now I’m not full of crappy flu, is Red Wine Wednesday! As you might have gathered by now, I went to the Margaret River wine region on holiday, which provided an excellent opportunity to taste some outstanding wines. Margaret River is really famous for its Cabernet Sauvignon Reds as it has a climate ‘almost identical to Bordeaux in a very good year’, in fact, some say that Margaret River Cab Savs are the best you can get in Australia. Some vineyards also produce some really top notch Shiraz (although these are much softer and less peppery than the Shirazes of the Barrossa) and some very decent Pinot Noirs and Tempranilo (Rioja style) too. With that heady mix in mind, this week – I’d like to introduce you to Happs 2009 PF RedSadly, I didn’t get to visit Happs winery – with kids in tow, going on a tasting expedition really offers very little for them. But whilst I was down there I was determined to find some of their wine and give it a bit of a taste test. Especially as Erl Happ shares my scepticism of the man made global warming alarmist nonsense that seems to have taken hold . 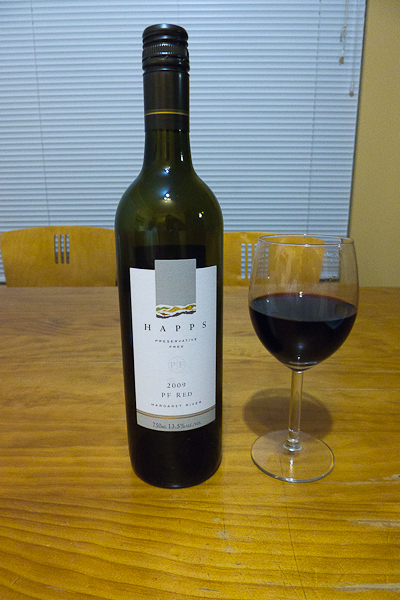 Happs http://www.happs.com.au/ – are a family run affair and have a vineyard just south of Dunsborough. The PF wines are preservative (most wines have sulphites added, which some people claim spoil the wine) free and made with the Pinot Noir, Shiraz, Grenache and Merlot grapes in a blend that varies slightly every year. So, with that mix, what do I think? Presentation: Classy, elegant, understated. Maybe a bit too understated – there isn’t much about this wine on the bottle!! I like the PF logo though – its a nice touch. Aroma/Smell/Bouquet: Smooth rich fruit, blackberry, blackcurrant maybe – quite a strong fruit aroma coming off the glass. There something else too – something quite dark – tobacco perhaps – is this the oak and tannins? There’s also something else, something sweeter – vanilla-like. The tasting notes say strawberry – maybe that’s what I was smelling. Finish: It finishes off with those glorious soft velvety dark tones again – like dark chocolate. For me, this is the highlight of the wine. The finish is really quite outstanding. Verdict: I really liked this wine. I think you can tell it’s been made a bot differently – there’s something smoother about the way it tastes – presumably the lack of sulphites does have an impact, however plenty of reds do use them and still manage just fine. The PF is no gimmick though, its a well crafted blend of some really nice grapes and the winemaking has allowed the undertones of tannins and oaks to come out well, making things really quite interesting. Score: 8/10 its not the worlds most expensive wine, but its a good solid interesting one that I’d seek out again. Love Margaret River – they produce some amazing wines! Great place for a little R&R too! Happy Wednesday.